14 March 2019 – The oldest inhabitant of the ORANGUTAN FOREST SCHOOL in Borneo, run by FOUR PAWS in cooperation with its Indonesian partner organisation Jejak Pulang, was diagnosed with a tumour of the left testicle. In a two-hour operation on 7 March, a team of veterinarians simultaneously removed the tumour and both testicles. Robin, a ten-year-old ape, did well during and after the operation. The laboratory tests of the removed tumour will show whether he will recover completely. After his recovery, Robin will be socialised with other orangutans. Since testicular cancer was suspected, orangutan Robin had to be treated as soon as possible. Before the operation, veterinarians had performed an ultrasound examination and a biopsy on Robin. Based on these results, the Indonesian Ministry of Environment and Forestry allowed the operation on the CITES-protected, orangutan. During the operation, which is similar to a castration, the veterinarians of the forest school cooperated with veterinarians of the Indonesian government. Since the right testicle also showed changes, both testicles were removed. “Robin survived the operation well and can now recover. The removed tumour tissue will now be sent to a laboratory and we will know more in a few weeks. We hope that the tumour is benign, because then Robin has a good chance to get well again,” says the head of the forest school, primatologist Dr. Signe Preuschoft. The Indonesian team assisting Dr. Preuschoft is supporting Robin in his recovery. After the operation, the animal caretakers padded his enclosure with leaves and soft cloths to make it as comfortable as possible for him. It is particularly important to keep Robin busy in the coming days, as primates tend to remove the stitches in surgical scars on their own. Castration makes it easier to socialise Robin. Adult male orangutans often become aggressive towards other orangutans. 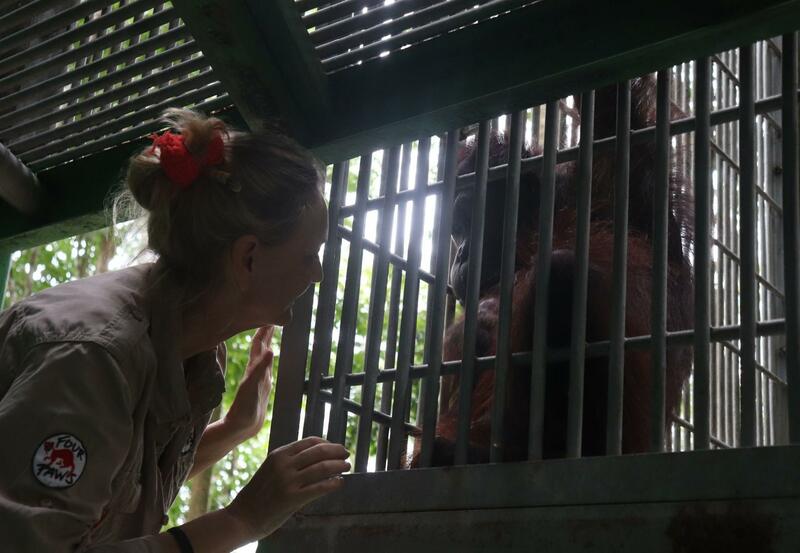 “Our programme actually focuses on having the orangutans only temporarily with us and then releasing them again. Robin, however, was kept as a pet for most of his life and has become too fixated on humans. He would hardly be able to survive alone in the wild. He would always seek closeness to humans and thus endanger his life,” says Dr. Preuschoft. Therefore, the project will now make room for one or two orangutans which cannot be released into the wild either and can keep Robin company. To this end, FOUR PAWS is also planning to build a large new enclosure. After everything Robin had to go through, he will soon be able to finally get comfortable in his permanent home in the species-appropriate environment. All eight primates in the FOUR PAWS ORANGUTAN FOREST SCHOOL in Borneo experienced terrible things: as babies they had to witness their mothers being cruelly killed. But the orangutan orphans were lucky to be rescued by the Indonesian authorities. In the forest school run by the international animal welfare organisation FOUR PAWS and its local partner organisation Jejak Pulang, all primates – with the exception of Robin – are trained and cared for by orangutan experts so that they can return to a natural forest in a few years' time. In the last four decades, the Borneo rainforest has been destroyed on a huge scale. Thousands and thousands of orangutans have fallen victim to the palm oil, tropical wood and coal industries. Every year two to three thousand orangutans are killed, often deliberately for a bounty, because they are regarded as harvest predators in oil palm plantations. Animal traders illegally sell defenseless orphans, whose mothers were deliberately killed, as pets. Borneo orangutans are among the most endangered species. FOUR PAWS has been working for the rehabilitation of traumatised orangutan orphans in Borneo for over ten years.